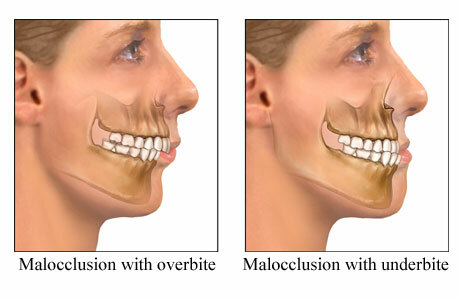 Overbite is a condition in which the lower jaw is not in alignment with the upper jaw. If the lower jaw is too far behind the upper jaw, this is called an overbite. The degree of difference where the teeth of the upper jaw meet the teeth of the lower jaw is the overbite. This is a fairly common condition and is fixable. In a normal mouth, the upper row of teeth is designed to sit slightly over the lower row in front of the two jaws, if they do not and you feel and see a misalignment, there could be an issue. A basic test will show you whether or not you have an overbite. Stand in front of a mirror, eyes looking forward and head straight. Close your mouth, bring it to rest without moving your jaws left, right or forward. Move your lips out of the way and look at your teeth. If the upper row of teeth cover more than half of the lower jaw’s teeth, you may have overbite. If your lower teeth are completely behind your upper row of teeth, you definitely have an overbite. This, however is only a crude way of diagnosis. Make an appointment with your dentist to be absolutely sure. There are many factors that go into an accurate diagnosis and the dentist is the right person to tell you what is what. Early detection is the best way to correct overbite. The best age would be just after all the baby teeth have fallen off and the adult teeth grow out permanently. The growth spurt years are typically the most effective years for any dental correction. The best and most obvious way to correct overbite is through braces. There are many kinds and types, but the brackets on the teeth with a wire running through them pulling your teeth in gradually over the course of several months is still the best way to go about correcting overbite. Braces work by putting pressure on the teeth, loosening it and bringing them together and to the required shape. This takes several months and as they loosen and straighten, they move less once they have straightened out as much as they have to, they stop moving. The bones around them then grow in and strengthen the new and improved position. This entire process can take up to two years.